"SOFT-NET" stands for the self-organizing fractal theory (SOFT) and nonequilibrium thermodynamics (NET). One of the key postulates of the SOFT-NET theory posits that everything that exists is a manifestation of the energy/matter comprising and flowing through the Universe. From this perspective, everything is connected to everything else via an all-embracing and all-permeating energy/matter flow, everything is in a flux, and everything changes through the emergence and transformation of energy/matter forms. One may notice that such an idea is not really new. Indeed, it echoes some of the most ancient and cherished human beliefs, as reflected in the conceptual frameworks of great Eastern religions (e.g., Hinduism, Buddhism, and Taoism) and Western philosophies (e.g., Heraclitus and Hegel). What is new is that the SOFT-NET theory also postulates that the energy/matter comprising and flowing through the Universe evolves from simplicity and disorder to complexity and order, in accord with the empirical laws of nonequilibrium thermodynamics, and that energy/matter self-organizes into a self-similar structure-process (a self-organizing fractal). By postulating a new form of global symmetry, namely, scale-invariance of self-organizational dynamics of energy/matter at all levels of organizational hierarchy, from elementary particles through cells and organisms to the Universe as a whole, the SOFT-NET theory naturally suggests a new discovery method based on scale symmetry, which is potentially applicable to all disciplines studying self-organizational phenomena. 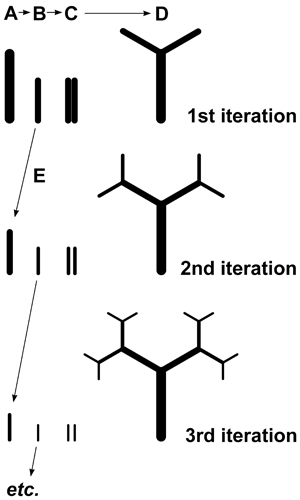 The resulting structure (a fractal tree) is self-similar. 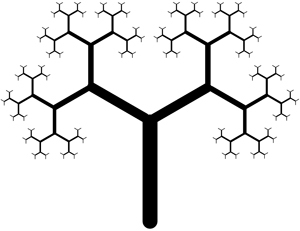 In principle, the downscaling and construction of the fractal tree can be continued infinitely. But then, in order to discern the organizational structure of the tree at progressively smaller scales, one would need a microscope of (infinitely) increasing power. However, one does not need a microscope, once one has understood the scale symmetry of the fractal tree by observing and comparing a few scales that are immediately available for observation and analysis. Also, if one were an "ant" living somewhere on the "branches" of a self-similar (fractal) "tree", one could deduce the overall structure of the "tree", whatever its size may be, simply by studying it locally and inferring both small details and the global structure from the considerations of scale symmetry. According to the SOFT-NET theory, humans are like "ants" living within a self-similar "tree" of reality, metaphorically speaking. From this perspective, the empirical data and knowledge structures accumulated in various sciences are reflections of different aspects of one and the same fractal reality. Although often accurate, these reflections appear as disjointed, incommensurate, and incompatible because they have been systematically misinterpreted by the dominating mechanistic mindset, which has been conceptualizing everything in terms of design, clockworks, machines, and engineering since the times of Newton and Descartes (e.g., see Newton_Critique). Because many sciences and disciplines studying different scales of the same self-similar reality have been developing largely independently from each other, the knowledge structures accumulated in different sciences and disciplines are identical, overlapping, or complementary, when properly reconceptualized and rescaled. Therefore, great discoveries can be made simply by reconceptualizing, comparing, and restructuring existing knowledge structures on the assumption of scale symmetry. The article "The self-organizing fractal theory as a universal discovery method: the phenomenon of life" published in Theoretical Biology and Medical Modelling shows that, indeed, the experimental data and knowledge structures accumulated in various disciplines studying life phenomena at different scales are consistent with the existence of global scale symmetry. Moreover, an application of the SOFT-NET analysis to life sciences and Earth sciences reveals a radically new perspective on the nature and origin of life, suggesting that living matter is an organizational state/phase of nonliving matter and a natural consequence of the evolution and self-organization of nonliving matter.